CHARLOTTE CELEBRATES JULY 4TH | South Charlotte Newcomers! Charlotte is a sparkling, summer, Southern spectacular with July 4th celebrations throughout the Queen City! Picnics, parades, fireworks and exciting family fun are always a part of a Charlotte Independence Day celebration! Novant Health July 4th Spectacular is Charlotte’s FAVORITE, Uptown fireworks show! The city never disappoints with amazing display of fireworks and live music! The celebration starts 6:00 p.m. at Memorial Stadium and the fireworks usually begin around 9:00pm. Kings Drive is a great viewing area! The WBT Skyshow is one of the Charlotte area’s most spectacular fireworks display. The doors open at the Knights Stadium at 5:00pm on July 3rd. The fireworks are after the Knight’s game. Baseball is a great American tradition and a great way for the family to celebrate July 4th! Military and veterans will be honored at the park. Carowinds Amusement Park offers rides, thrills and fireworks July 4-August 11. Each night the theme park will light up the sky with “night of Fire”. Thrilling rides and thrilling fireworks! The U.S. Whitewater Coca Cola Fourth of July Festival will be held on July 3-4th. Live music and fireworks over the whitewater river are a wonderfully exciting and picturesque combination! Another water July 4th water celebration will be at Lake Wylie. This annual fireworks display can be viewed from the Buster Boyd bridge as well as at the Lake restaurants and boat landings. 3990 Charlotte Highway Lake Wylie, SC. The town of Matthews will offer a Peoples Parade through the center of downtown. Kids are encouraged to decorate their bikes and join the parade! The parade begin at 5:30 and will end at Stumptown Park with live music, giveaways and food vendors. Celebrate Independence and the freedom of living in the Carolinas! 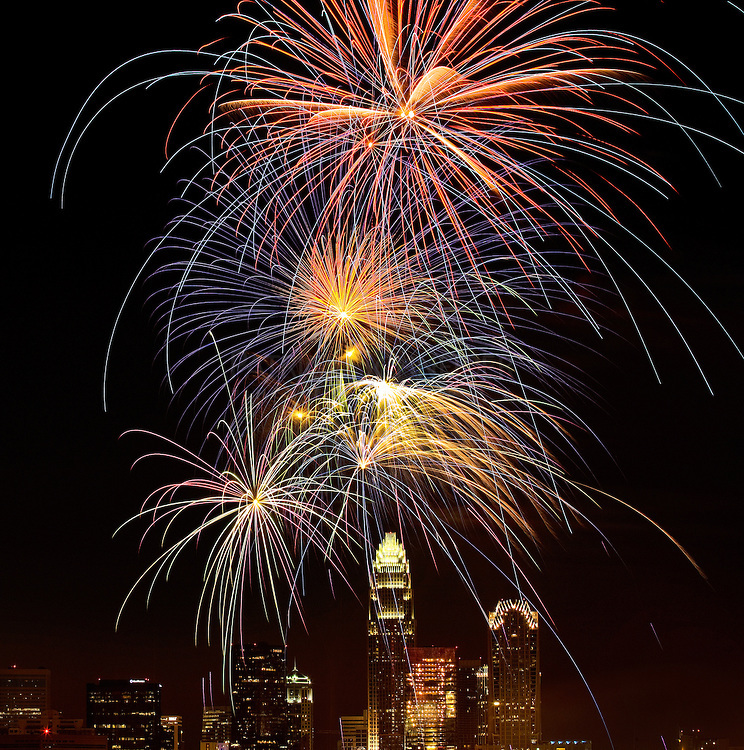 Charlotte is the place to be for fireworks and celebrations on the Fourth of July!